And so Tony Campolo, on his own dime, came to her college and instead of a bait and switch promise of a Tony Campolo talk, those present had Tony Campolo himself. When she told me this story, I’d never heard of Tony Campolo. He’s still a bit on the margins of my consciousness given that I’m a Catholic and he’s an evangelical, but he falls outside the stereotypical politically conservative worldview of evangelicals and instead holds rather progressive views (he most recently intruded into my consciousness with a brief online piece condemning the election of Orange Hitler). 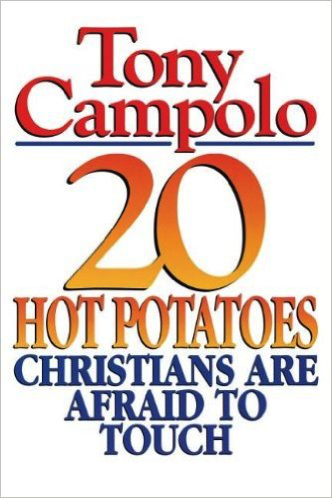 This book, while a bit old and focused on some aspects of culture that seem settled (for example, “Can Christians undergo psychotherapy?”), provides an interesting insight into Campolo’s worldview. I suspect that in many instances his point of view has become more progressive than is revealed in this book, but it’s still a very clear look at what it means to be an evangelical liberal and how his religion impacts his political and cultural perspective.